I had never been to this location before but a fellow photographer encouraged me to pay it a visit. I arrived just moments before sunset after a long drive from Moab. I had almost no time at all to compose any shots before the drama of the storm lighting was gone. Photos I had seen of this place in the past included a hoodoo which was no longer there. I realized that this big rock in the foregound was once that impressive, almost iconic hoodo. 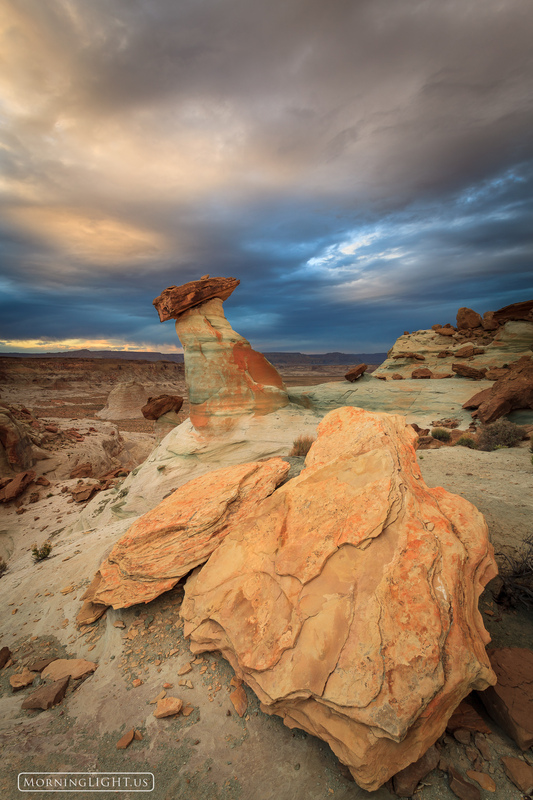 These amazing rock formations that took so long to form are so delicate that they can easily vanish almost overnight. Photo © copyright by Erik Stensland.